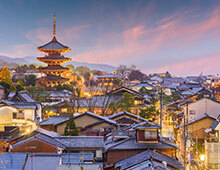 Once the capital of Japan and the emperor’s residence from 794 A.D. until 1868 A.D., Kyoto is one of the country’s ten largest cities and is on the island of Honshu. It is known for its 2,000 Buddhist temples and Shinto shrines, sublime gardens, traditional teahouses, wooden houses, and geisha. The city embodies the Japanese aesthetic concept of wabi-sabi—the art of finding beauty in transience or imperfection. 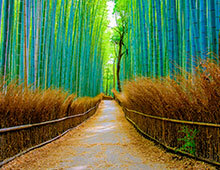 With its rich colors, tradition, history and culture, Kyoto is a city which allows visitors a glimpse into the past. 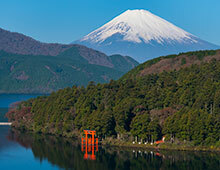 It also happens to have one of the world’s largest collections of UNESCO World Heritage sites. With so many temples and shrines to see, things to do and culture to experience, Kyoto is truly a city steeped in history and culture and should not be missed! DEADLINE TO BOOK IS SEPTEMBER 28, 2018 OR UNTIL SOLD OUT! This pre-package does require a high level of mobility as all the tours require extensive walking (up and down stairs and hills) and standing for long periods of time. If you do have limited mobility and feel that you are still able to do the activity level requirements, you are required to travel with someone who can assist you. 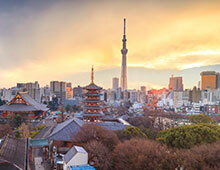 Japan’s capital, Tokyo, mixes the ultramodern and the traditional, from futuristic skyscrapers to historic temples and shrines. You can practically feel it pulsing, with the neon signs, the crush of people, and the very punctual, high-speed trains. Then there’s a bit of green and calm on the city’s temple grounds or classical gardens. Prior to 1868 A.D., Tokyo was known as Edo which became Japan’s political center in 1603 A.D. when Tokugawa Ieyasu established his feudal government there. A few decades later, Edo had grown into one of the world’s most populous cities and in 1860 the capital was moved from Kyoto to Edo, which was renamed Tokyo—Eastern Capital. Today, Tokyo offers an unlimited choice of history, culture, shopping, entertainment and dining to its inhabitants and visitors. 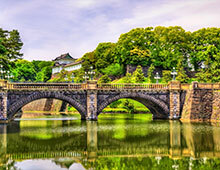 A visit to Japan is simply not complete without a visit to Tokyo. This post-package does require a high level of mobility as the tour requires extensive walking (up and down stairs and hills) and standing for long periods of time. If you do have limited mobility and feel that you are still able to do the activity level requirements, you are required to travel with someone who can assist you.